Happy holidays from our team to yours! Thank you so much for being a great resource in our community, sharing the Retirement Connection Guide, visiting our website for networking information, forwarding the newsletter when helpful to others, and all the little things you have done to support us this past year. We hope you and your referral sources can celebrate with us at the Senior Service Network meeting for a Holiday Gathering on December 21st (please note this is a week earlier than normal). We also hosted our first Sponsor Breakfast in Salem- thank you so much to all that joined us! 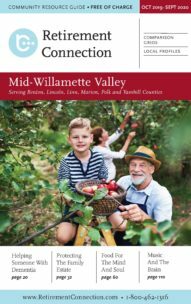 We are looking forward to growing this event and will be hosting another MId-Willamette Valley sponsor breakfast in 2017.